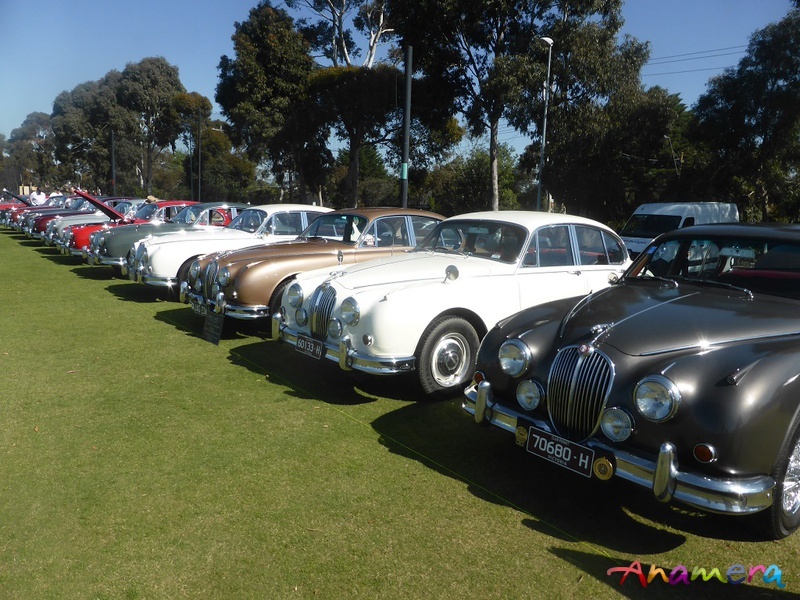 Melbourne, VIC, 18 Nov 2018 - The Jaguar Car Club of Victoria has just held its annual Concours d'Élégance on the sports field of Wesley College in Mount Waverley, one of the Eastern suburbs of Melbourne, Australia. The event has been held there for a number of years now. It is easy to get to, centrally located, good location and plenty of parking – both for the cars on display on the sports field, as well as the public who are made very welcome to view classic Jaguar, right up to the current models. This year as in the past, the number of cars on display was well over 250. The organisers go to the effort to have all the models displayed together with string lines on the field to make sure the cars are lined up perfectly and make it a delight for photographers to get photos of lines of Jaguars. This year, there was a notable absence of cars seen in the past, such as D Types (replicas) and various other classics that we had seen in the past. There were only three Mark 1 Jaguars and only three Mark VII Jaguars. On the other hand, many Mark 2’s, XJs’s, XJ’s of all models and a very big line-up of E Types made up for it. Also present a considerable line-up of the modern XK models of all colours and types. Some of the outstanding cars this year were as follows. a range of pre-war SS and Mark IV’s. As the Jaguar XJ was 50 years old, a timeline of all models was on display, from a 1968 XJ6 onwards; some in completely original unrestored condition. I overheard one member talking about her XJ6 inherited from her father that was completely original and unrestored in its fawn colour. There was also a gold V 12 E type roadster with detachable hard top in what I would call a barn find condition with faded paint, bubbles in the paint on the roof. Perhaps not an original colour but good to see it actually being driven. A couple of XK’s and E types that were very “American”, with their wide whitewall tyres. Other outstanding cars were of course the Daimler Super V8 - very rare - the early XJ6, 340, S type (modern), and so many more outstanding cars. Winners on the day were given rosettes designating Bronze, Silver and Gold. Being the awarded points out of 100. Report and Photos: Heinz Schendzielorz.